Students that accrue $50 in fines are automatically blocked from borrowing library materials. Unpaid fines and unreturned materials will result in a hold on student grades, official transcripts and diplomas. To renew or request a book online follow our pdf guide. Books can be renewed up to three times. DVDs can be renewed one time. Reserve books and iPads cannot be renewed online. Overdue books cannot be renewed. If a book you need is checked out you can place a request to be notified when it is available. You will receive an email when the requested book has been returned. The item will be held for you for one week. Materials that are lost or damaged may be subject to additional fines and fees. 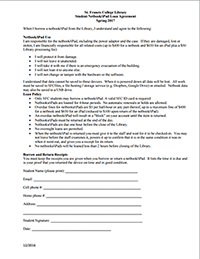 To checkout iPads you must fill out the iPad-Laptop Agreement Form each semester.